The AJS Cadwell will take you back to a time where motorcycles were built for fun and excitement, where British bikes ruled and rock n roll was the language of youth. The Cadwell beautifully recaptures the spirit of the motorcycles of the 50’s and 60’s where owners would modify their bikes into the style of Café Racers. The AJS Tempest Scrambler is a visual treat, overflowing with the spirit of youth. Built on the Cadwell platform but with a longer swinging arm and an 18″ front wheel. Starting is a breeze with its electric start. Its lightweight makes for easy handling. Standard specification includes: adventure tyres, alloy wheels 18″/17″rims, 37mm diameter front forks, stainless steel exhaust, combined brakes, electronic fuel injection, and a plush diamond pattern seat. A neat luggage rack which will readily accept many proprietary luggage boxes is available as a low cost accessory. 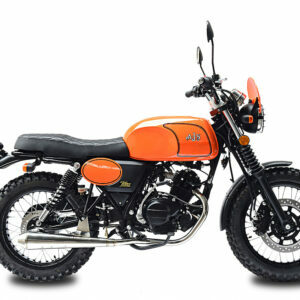 Available in three vibrant colour options which reflect the colours of great AJS scramblers from the past. Blazing orange, Mojave yellow or Oasis blue. We have the Orange Tempest in stock. Viewing is welcome and recommended. 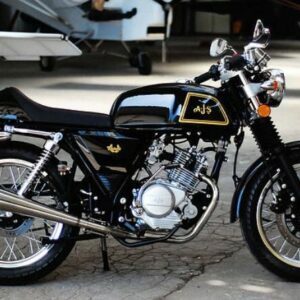 Of course, there’s electronic ignition, electric and kick starting, a disc brake up front, slash-cut mufflers, and blacked-out custom-look wheels. 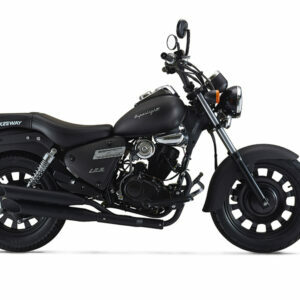 The Superlight standard even comes with leather saddlebags, so you can’t go wrong with this one.